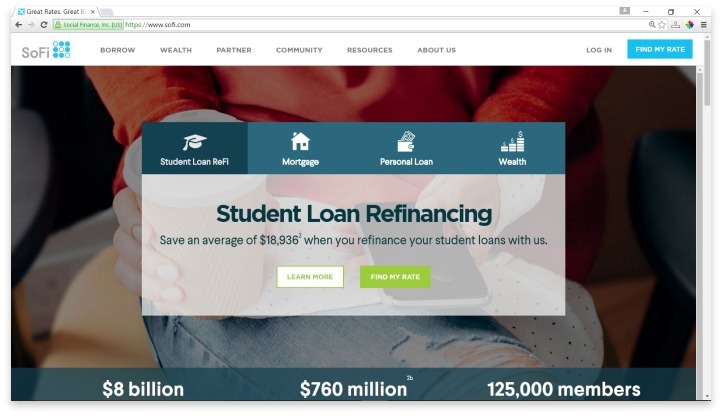 SoFi, or Social Finance, is a personal loan provider that mostly targets students that want to refinance their student loans. It was founded in 2011 by Stanford alumni, and expanded to providing both mortgages and personal loans after three years of operations. Like several other online lenders, SoFi looks at borrowers with a more holistic attitude towards approval; they don’t only consider credit score, but also earnings (or earnings potential, for students), payment history on other debt, and various other life factors. The social experience that SoFi has created for its customers has created a sense of teamwork, and they also offer career and credit counseling to add to this feeling. At SoFi, potential borrowers are rated on four things: career experience, monthly income and expenses, financial history, and education. This is great news for students or young adults who haven’t had a chance to build a credit score yet, which means that most of SoFi’s clients are under 40. In order to cater to this crowd, SoFi goes above and beyond to create a social atmosphere, hosting get-togethers across the country, and offering career counseling. Their customer service team is as outstanding as their event coordinators, with seven-day-a-week access and plenty of active social media presence. SoFi offers personal loans between $5,000 and $100,000, and terms for three, five, or seven years. Their interest rates run from 5.95% to 12.99%, with auto-pay. The money is deposited directly into a checking account, so it can be used for anything. In order to apply, potential borrowers need only to be currently employed somewhere, and have graduated from a participating Title IV university. Once you apply, SoFi looks at an in-depth analysis of your ability to afford the loan, including taking into account what you will be earning when you enter the workforce that your degree applies to. Checking out your eligibility won’t hurt your credit score because SoFi uses a soft pull to estimate interest rates. One of the most intriguing things about SoFi overall is that they charge absolutely no fees whatsoever, unless your payments are late. If you pay your loan payment on time until it is done, you won’t ever pay a single penny in hidden fees. Another interesting service that SoFi offers is Unemployment Protection. Borrowers who lose their job can put a three-month hold on their loan payments, for up to a total of one year over the entire duration of their loan. This helps those just starting out who may need time to find just the right position. SoFi is overall a great choice, especially for young potential borrowers who appreciate the perks of a community or team. For young potential borrowers who appreciate the perks of a community or team, SoFi is overall a great choice. They offer plenty of positive features, and the fact that they charge no fees at all on their loans puts them far ahead of almost all other online lenders. The unemployment protection and career placement services are icing on what is already a very nice cake. Have you had an experience with this company? Please share your SoFi reviews below.